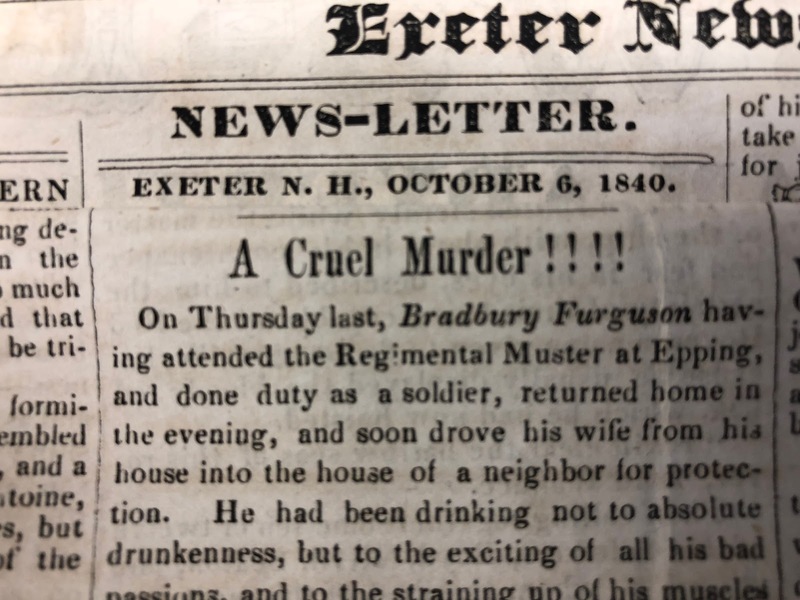 This "Historically Speaking" column was published in the Exeter News-Letter on Friday, August 17, 2018. Eliza Ann Ferguson deserved better. Born with the aristocratic name of Eliza Ann Frothingham in Portsmouth, New Hampshire, she was said to be “well educated and moved in a good circle in society” by the Portsmouth Journal. In 1827, when nearly an old maid of 30, she married a journeyman hatter by the name of Bradbury Ferguson. He was a few years younger than she, and may have believed they were the same age. In the spring of 1840, he listed her age, and his own, as “under 40” on the U.S. Census. They were living in Exeter by that time, with their six children. All was not well in the household. We know from later testimony that Ferguson and his wife quarreled loudly. Ira Hoitt testified that when the family lived on Main Street near the Merrill hat factory, across the street from his house, he often heard Ferguson “abusing his wife – calling her bad names.” One night he was awakened by shrill cries of ‘murder!’ followed by a desperate knock on the door. “Mrs. Ferguson was standing at the door in her night clothes and a child in her arms. It was a cold night. She had stood out so long that their clothes had become frozen.” Hoitt and his wife made a fire and warmed the desperate visitors, but soon Ferguson arrived, demanded his child and stormed out. Eliza Ann meekly followed shortly thereafter. Several weeks later, a similar scene played out, but this time she was injured and bleeding. Hoitt said that he and his neighbors were interrupted as many as ten times that winter, “so frequently, that his family seldom went to bed without the expectation of disturbance from Ferguson’s brutal treatment of his wife.” He was briefly jailed in May for the abuse, acting very penitent while there, but suspicious and jealous again as soon as he was free. Convinced – with no evidence – that she was unfaithful to him, he told Hoitt that she was, “a bad woman” and that he would be divorced from her. Hoitt replied that, “he could not get divorced from his wife, but that she might from him, because she had done nothing that could justify a divorce. Ferguson then said, ‘If I can’t get divorced, I will put her in a way that she won’t trouble me any longer.’” The family then moved to Front Street, just past the cemetery, and Hoitt’s neighborhood settled into relative peace. His new neighbors included John Gordon, John Strickland, the Hook family and Samuel Leavitt. Ferguson, Strickland and Leavitt all served together in the local militia. On October 1st, 1840 they travelled to Epping for the annual muster. There they trained, drilled and drank. Strickland couldn’t recall whether Ferguson drank to excess that day, only mentioning that they were drinking before they arrived, he thinks twice more during the muster and at least several times while on the journey home. So, you know, not much. They arrived back in Exeter at a respectable hour – eight o’clock. Strickland and Leavitt both went home to bed. Within an hour, Eliza Ann was desperately pounding on the door of John Gordon’s house, begging for safety. Ferguson soon arrived demanding his wife’s return. The police were called and Eliza Ann was convinced to go back home with her husband. She was reluctant, as he had struck her earlier. “Show the wounds,” he demanded in front of the police. 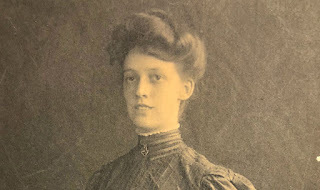 “If I cannot show wounds, you know, Mr. Ferguson, that you have abused me,” she replied. John Gordon remembers seeing the gun in the couple’s bedroom. Police officer, John Foss testified that it was there. “As we were coming away I took up the gun which was in the corner of the room.” The gun had been left in the room by the Ferguson’s eldest son, John. He testified that the gun belonged to his father, although he had been using it to kill squirrels and birds a few days earlier. He’d returned the gun to his parent’s bedroom and left it – loaded – in the corner. The police decided it was best to leave. This seemed to be a family problem and they’d been called to the Ferguson house so often this was just another night. Eliza Ann stayed in the house, but she refused to join her husband in bed. He slept for a few hours, woke up about 2 am and, upon seeing his wife still seated in a chair in the room, took up the loaded gun, pressed it to her abdomen and fired. Two of his sons were awakened by the sound and, finding their father downstairs, asked what had happened. John testified his father told him he had shot mother. “William asked father what he shot mother for. He replied that she provoked him to it, but did not say how she provoked him.” Ferguson decided to leave – maybe run to Canada – but couldn’t even get himself packed up. He demanded of the dying Eliza Ann, still lying on the floor at this point, where his clothes were. One of the last things her sons heard her say was, “in the closet.” After that, she begged him to put her on the bed, which he did, and then she spoke no further words. Drs. Perry and Gordon were called the next morning to examine Eliza Ann’s body. She’d received one shotgun blast from close range – so close it burned her clothing and skin. The blood soaked through two mattresses pooling under the bed. Ferguson was captured in Northfield a few days later. Locals were on the lookout for him. The trial was held the following February in Portsmouth. 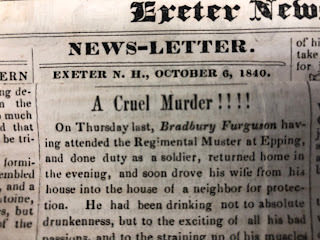 There was no question that Ferguson had killed Eliza Ann, but a new revision of law in 1837 mandated that a first degree murder be punishable by death. Although the jurors were all carefully screened to ensure that none were opposed to this guideline, they brought in a verdict of second-degree murder because Ferguson did not load the weapon himself before firing. He didn’t get off easy; he was sentenced to two years of solitary confinement followed by hard labor at the State Prison for life. He died there twelve years later. The six children were granted the right to change their surnames from Ferguson to Frothingham. Young John, who testified in court against his father, went on to serve in the Civil War as a Lieutenant Colonel and lived until 1881. He’s buried in Brooklyn, New York. His mother’s grave is unrecorded.